PORTLAND, OR – Showers Pass (www.showerspass.com) Women’s Refuge Jacket – a unique combination of hard-shell waterproof breathable performance fabric, ventilation, and reinforced shoulders that seamlessly transitions style, comfort, and design from bike to trail and mountain, to everyday errands around town. 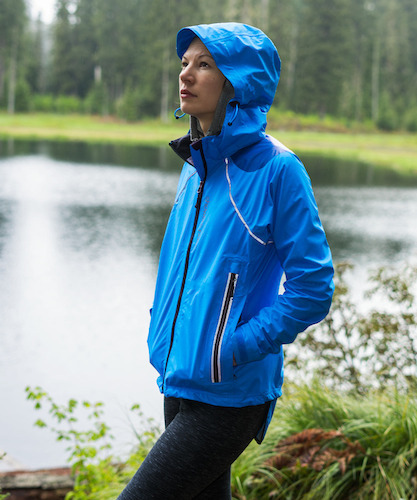 Crafted with eliteTM 3-layer waterproof breathable performance fabric, fully taped seams, and waterproof zippers, the Refuge Jacket blocks wind while providing stylish, superior comfort. Extra-long core vents on the front of the jacket prevent overheating and remain easily accessible while wearing a backpack. Reinforced shoulder patches protect the jacket from backpack wear and tear while the 360-degree reflective trim provides visibility to motorists at night. The Refuge design features provide maximum versatility. The removable adjustable hood is large enough to cover any helmet but stows easily inside one of two interior jacket pockets during improved weather. A magnetic drop-down waterproof tail protects against tire and road spray and performs double-duty keeping backsides dry on wet stadium seats.